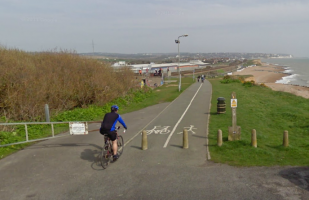 Work is under way to construct a new two-mile cycle and pedestrian route along the seafront - from Galley Hill - Bexhill to Hastings promenade. The path will create a four mile long traffic-free route and will provide a safe and direct alternative to the busy A259, which is very often congested with traffic. It will also open up the coastline and the beach and encourage more people to travel by foot and cycle. Jackson Civil Engineering was awarded the contract and it is hoped will be complete by the New Year. The link is part of the Sustrans' national Connect2 project, which is seeking to extend the charity's National Cycle Network all over the UK. The project was awarded £50 million from the Big Lottery Fund, and part of this grant will be used to fund the path alongside funding from East Sussex County Council. The new route will make a real difference to how people make their everyday journeys.